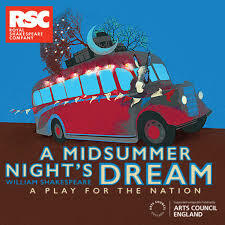 I’ve recently been to the RSC’s new A Midsummer Night’s Dream, subtitled A Play for the Nation. After its initial performances, it’s going on tour to 11 towns and cities around the country. In each place the 18-strong professional cast will be joined by one of 14 local amateur groups playing the “rude mechanicals”. Groups of local schoolchildren will be some of Titania’s fairies. Later in the summer it will return to Stratford when each group will perform on the RSC stage. RSC Deputy Artistic Director Erica Whyman directs the production and is I believe responsible for the idea. As if touring wasn’t complicated enough, the logistics are mind-boggling. So hats off to her for making it happen. I couldn’t help feeling, though, that so much energy has gone into the idea of the production that the actual event falls a bit flat (though I acknowledge I have seen an awful lot of productions). It’s a curiously old-fashioned sort of experience with hardly a nod to the darker play with its Freudian sexual undertones that Peter Brook uncovered back in 1970. We’ve got used to the Dream being erotically charged, but not this time. Instead of a bower of seductive red feathers Titania and Bottom cosy up under the uninviting lid of a grand piano. It’s now almost accepted that Hippolyta, Theseus and Philostrate (or at least some of them) morph into a less controlled version of themselves in the forest, becoming Titania, Oberon and Puck. In different productions I’ve seen the First Fairy and Puck tearing the clothes off each other, and the lovers reduced to their underwear. A few years ago, during one performance a schoolteacher marched his entire class out of the theatre because the sexual content was so explicit. Here everybody keeps their clothes on, and there’s no doubling. There’s a dilapidated set with random objects scattered around it (presumably easy to move to different venues), with most of the costumes having a 1940s feel, and a female Puck to confide in the audience, dressed as a circus ring-master with top hat and black suit. Nobody’s going to be offended ore embarrassed here. It’s an enjoyable evening with everyone acquitting themselves well, and lots of laughs. For me it’s all a bit too safe, too reassuringly nostalgic. If this is a play for the nation, it’s a nation that doesn’t want to be challenged. The world outside may be scary, but in the theatre we can solve disputes with a few drops of juice squeezed from a flower. It’s not their fault, but I’d love to have seen the multiculturalism of the professionals onstage reflected in the audience and the amateur players. 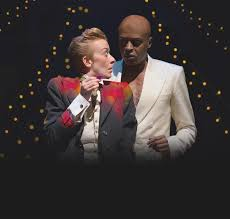 Hopefully it’ll be different at other venues around the country: Shakespeare, the most internationally-revered of playwrights, has to appeal to us all. Leah Hanman on the right, in her Puck costume, standing next to W Bridges Adams. 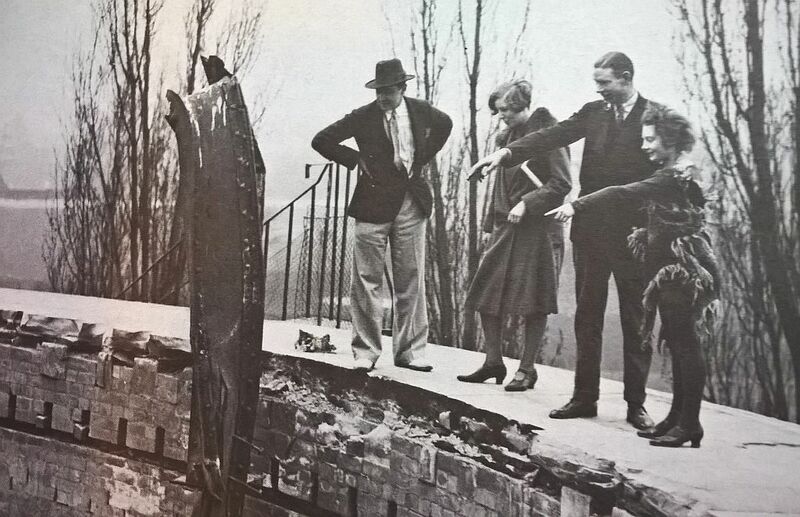 They are surveying the wreckage of the Memorial Theatre after it was destroyed by fire in 1926. “I was playing Shakespearian roles before the turn of the century. A treasured relic is a programme of the Memorial Theatre at Stratford-upon-Avon for April 17 1899. In this I am listed in the role of Michael, a ‘prentice, in Henry VI, Part 2. I was then only nine years of age… I was still with Mr Benson’s Company for the Shakespeare Festival at Stratford in 1906…Our company was keen on hockey and cadets from the Army School at Stratford joined us in mixed matches. In one game one of the young Army gentlemen caught me a resounding crack on the ankle – a matter that was immediately noticed by Mr Benson. He strode up to the young cadet and said, in his somewhat sepulchral voice: “Young man, you have done grievous harm to my principal dancer!”. But the role in which I was best known was that of Puck, in which I made my name over the course of the 25 years I spent with Mr (later Sir) Frank Benson’s company. What’s notable is how integrated Benson’s company were into the town. 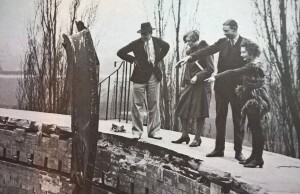 As well as the theatre performances and the sporting events that she mentions, Benson organised outdoor events such as folk festivals and the crowning of the May Queen. Even those who didn’t go to the theatre could have had some involvement with Frank Benson and his company. The closest recent equivalents were The Dillen and Mary, After the Queen, directed by Barry Kyle in 1983 and 1985. The Dillen might have been subtitled “A Play for Stratford”. Over 100 locals performed as extras, playing Stratford townspeople in plays based on the memories of some of the poorest inhabitants, George Hewins and his family. At a time when the RSC seemed barely connected to the town, it established a sense of community based around the theatre, which then flourished. Some of the amateur groups still performing in the town can trace their foundation back to The Dillen. The best legacy of the new A Midsummer Night’s Dream will be to do the same for a younger generation up and down the country. This entry was posted in Legacy, Shakespeare on Stage, Stratford-upon-Avon and tagged A Midsummer Night's Dream, A Play for the Nation, amateur, Barry Kyle, Erica Whyman, Frank Benson, Leah Hanman, The Dillen. Bookmark the permalink.